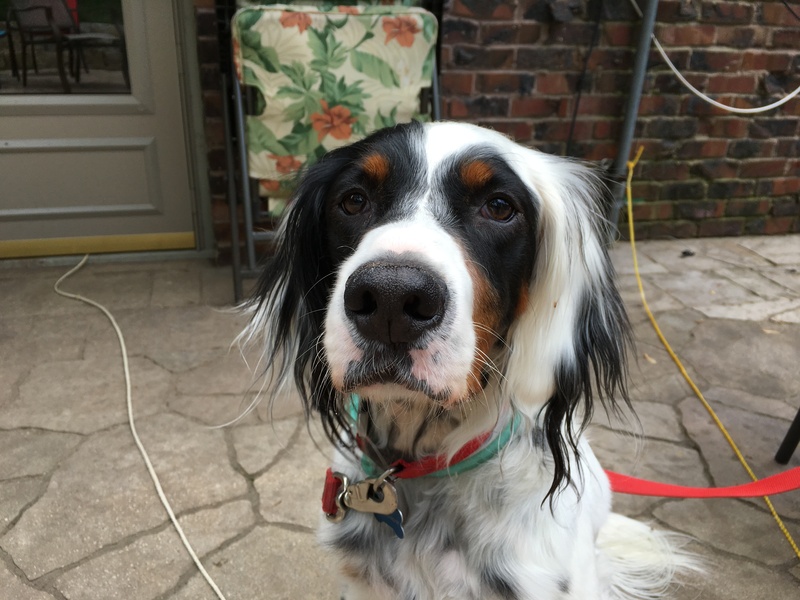 Ranger is a five-year-old Llewellin Setter who likes to bark, doesnt recall on command, is fearful of bicycles, pulls on the leash and has bitten a few people unexpectedly. Knowing that Ranger had a propensity for biting, I had pulled out a small handful of high-value treats so that I could distract him and hopefully create a positive association with my arrival. When Ranger appeared at the door, he seemed alerting but not aggressive. He was not giving any signs that indicated he was territorial, aggressive or reactive so I opened the door a tiny bit so that I could offer him one of the high-value treats. Because Ranger took the treat very well and did not give me any body language that indicated he was upset or aggressive, I opened the door a bit more to allow him the opportunity to sniff me. Instead of using his nose, Ranger decided to use his mouth instead. While a dogbite in itself is cause for concern, I was more alarmed with Ranger’s guardian’s response to the encounter. When she commented that everyone had a problem with her dog except for her, that was a big red flag. When she allowed the dog to pull its way past her and continue to walk behind him as he pulled her along to get near me, that was another really big flag. Fortunately I was able to get the guardian to stop short of allowing Ranger to get access to bite me again. We started to discuss the situation and I was again alarmed when the guardian started to make excuses for Ranger’s behavior such as the fact that many people do not arrive at the door. Because it did not seem clear to me that the guardian was realistic about her dog’s capabilities and her control of him, I pulled out a basket muzzle and instructed her on how she could attach it. The guardian was not pleased with the muzzle that I had selected. She had previously used a snout muzzle which look far less intimidating than the type of muzzle that I had selected. However, looks have absolutely nothing to do with the selection of a muzzle when you have a dog that bites. A snout muzzle, the kind that wraps around the dog’s nose, does not allow the dog to open its mouth. While this prevents the dog from being able to bite, it also prevents the dog from cooling down. Dogs cool down by allowing fluid to evaporate off of their tongue with their mouth open. It is very easy for a dog to overheat and actually die if you use a snout muzzle while the dog is engaging in an athletic activity or is in an unbalanced and agitated state of mind. As soon as the muzzle was attached to Ranger’s collar, his disposition changed dramatically. He was clearly uncomfortable with the muzzle; standing in place and not moving or interacting with anyone. Usually I like to introduce a muzzle over the course of three days; gradually increasing the amount of time the dog has the muscle attached while also simultaneously providing positive reinforcement. When done properly, the dog actually looks at the muzzle as a positive and is happy to have it attached. After we wrapped up our conversation about how to introduce the muzzle this way, I started to ask the guardian questions about the dog’s day-to-day routine and behavior. I was concerned about the guardian’s responsiveness to the conversation. While I didn’t take it personally she had a frown upon her face as we went through this discussion and repetitively made excuses as to why it was OK for Ranger to act the way that he did. I was probably more stern with this guardian and then any other conversation I’ve had with a dog behavior client since I started. While I have no doubt that the guardian is aware of the danger of her dog’s behavior, I was very alarmed at how she consistently pivoted to making an excuse rather than accepting the fact that it was a problem and listening to how we could curb the and modify the behavior. It was clear that the guardian has a very close bond with her dog and loves him very much so this was most likely a very difficult conversation and meeting for her to have. To her credit, as the session went on she appeared to become more open-minded and accepting of the techniques and structure that we discussed. In my opinion, Ranger’s aggressive behavior was a direct result of not having any rules or structure in his life combined with his guardian’s over petting of him without any context (Ie making him earn it). In Ranger’s mind, affection and attention was his right and the house and his guardian are his possessions. To help change how Ranger thinks about himself and his guardian, I went over some rules and structural changes the guardian can make. Incorporating some rules and enforcing them immediately will be crucially important for Ranger’s rehabilitation. If the guardian is inconsistent in enforcing these rules or makes excuses as to why it’s OK for a dog to break a rule, it will make it confusing for Ranger to understand. Consistency and good timing of our corrections is how dogs learn what the boundaries and limits are. Letting the dog break them is a HUGE error when rehabilitating a dog with these issues. Correcting the dog when it breaks the rules will help the dog start to see and identify the human as taking over the authority position. This is going to be one of the most important parts of Ranger’s rehabilitation. The Petting with a purpose technique that I outlined in the above video will become a powerful tool to change the leader follower dynamic if the guardian is able to practice it. I have strong concerns about this as the guardian struggled mightily at my request to stop petting or consoling the dog as we had our conversation. AT times she literally coolant help herself. By only providing Ranger with attention or affection when he earns it by complying with a simple request like sit, come or lay down, the guardian will be able to change how Ranger interacts with other humans as he will learn to see them as authority figures. In the course of our discussion I learned that Ranger’s guardian had often utilized workarounds instead of addressing and fixing the root problem. A great example of this was Ranger’s failure to recall on command when he was out in the backyard. This sort of dog obedience training will go a long ways towards helping Ranger respond when his guardian gives him a command or correction. Because ranger didn’t have many rules in his life and considers himself to be a peer of his guardian, listening to her was optional in his mind. Practicing dog behavior training techniques like this will change that perception. A few of the other things that I suggested the guardian do was to always follow through and to always outlast the dog. Many people think it’s no big deal if they ask their dog to sit and instead it walks away. But this is a classic example of the dog showing that it considers a command to be optional. To this point, I suggested that the guardian start to stand up and follow the dog until he complies when she gives him an order. By always following through and not giving up until the dog complies, Ranger will learn that these changes are not temporary and that he needs to modify his behavior to match. We wrapped up the session by going over a more structured way of feeding the dog. Because eating is such a primally important activity for dogs, adding structure will go a long ways towards helping Ranger identify as being in the follower position. This was a difficult session for everyone involved. There was clearly a lot of tension in the air as we had our very frank discussion. It’s never easy to admit that one of your loved ones has a problem. Ranger’s rehabilitation is going to be entirely determined by how his guardian adapts to the techniques and exercises that we went over during the session. If she consistently enforces the rules and boundaries and starts practicing the Petting with a purpose strategy as well as controlling the feeding ritual, she should start to notice the dog is more responsive and respectful within a few days to a week or so. But if the guardian is inconsistent, fails to enforce the rules in a timely fashion, continues to pet the dog for no reason and allows him to set the tone, he is going to continue to act as he has. I asked the guardian to follow up with me in a week or two after the session to discuss how things are progressing as well as to contact me if she has any questions or setbacks along the way. We may need to modify some of the techniques based on how responsive he is to these new changes. Hopefully I was able to effectively communicate how important it will be for the guardian to assume a leadership role which will enable Ranger to stop trying to control the situation himself. If she can get the dog to start to identify as being a follower, all the rest of Rangers problems will be absolutely correctable with the right attention, techniques and exercises.